Dr. Doyle is a board certified comprehensive ophthalmologist and a fellow of the American Osteopathic College of Ophthalmology. She received her bachelor’s degree from Michigan State University and her medical degree from Kirksville College of Osteopathic Medicine. She performed a medical internship and ophthalmology residency at Doctors Hospital in Columbus, Ohio. Dr. Doyle specializes in Refractive and Cataract Surgery, as well as comprehensive ophthalmology. Dr. Doyle remains active as an educator in her current positions as Clinical Assistant Professor of Optometry at The Ohio State University and Clinical Assistant Professor of Ophthalmology at Ohio University. She is a member of numerous state and national ophthalmology organizations; including the American Osteopathic Association, Ohio Osteopathic Association, Columbus EENT Society, Ohio Ophthalmological Society, American Academy of Ophthalmology and American Society of Cataract and Refractive Surgery. Dr. Doyle is dedicated to providing her patients with state-of-the-art technologies. She is able to discuss laser vision correction from a personal note since undergoing Lasik herself. Her excellent training and personal laser vision correction allows her to offer superior results to her patients. 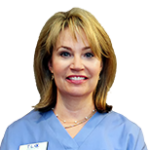 Dr. Louise Doyle is a surgical ophthalmologist who is affiliated with The Eye Center in downtown Columbus, Ohio. She also has a busy comprehensive practice at Mid Ohio Eye. Outside of ophthalmology Dr. Doyle enjoys skiing, hiking, cooking and spending time with her family and friends. She and her husband, Carl, delight in spending time with their children and grandchildren.